« United Rentals Golf Tournament – $14,000 !!!! Intersection of Broadway and West End at 16 Avenue South. 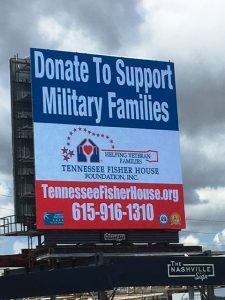 Tennessee Fisher House Billboard at the intersection of Broadway and West End at 16 Avenue South. It is the huge billboard on which country music artists feature their new work, and one of the most traveled intersections in Nashville.